Marion grew up in Germany with a house full of cooks. She began her own training in her parent’s restaurant. Once of age, Marion studied classical culinary arts in Germany, where she performed a three year apprenticeship in French cuisine and cooked in several fine dining restaurants and a health clinic (Buchinger Clinic). In 1997 she moved to beautiful Big Sur, California where she co-created a farm and homestead, raising goats, chickens, bees and managing an extensive garden. Marion grew her own vegetables, herbs, olive and fruit trees that would all become ingredients in her cooking. While in Big Sur Marion worked at the renowned Esalen Institute, where she cooked and baked healthy and delicious meals for up to 250+ guests at a time, for more then 5 years. This time proved transformative. Marion learned the essential aspects of eating and preparing food mindfully. At Esalen she especially loved the organic garden and using the amazing fresh produce in her cooking. She observed how the food and ingredients affects us on almost every level: body, spirit and soul. Marion’s legacy at Esalen lives on in the Esalen Cook Book she helped create. Now based in Ashland, Oregon, Marion opened her own catering business in 2005 and travels extensively to cook at different destinations, from California (Wilber Hot Springs) to Maine and everywhere in between (and beyond). 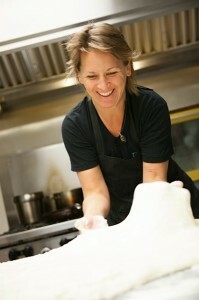 She sources most of her ingredients locally and keeps her finger on the pulse of produce working with Willow-Witt Ranch.